Special bracing, top-quality tonewoods, and excellent L.R. Baggs electronics pair up for a guitar that is sure to please. The L.R. Baggs StagePro Element is a side-mounted preamp/EQ that offers battery access and a full chromatic tuner that is hidden beneath the control panel to maintain a clean, classy look. The three-band EQ with phase inversion and Garrett Null notch filter controls deliver warm, pristine sound even under the most challenging conditions. The AD60CESHB Dreadnought is part of the Artist Series, now “The Award Winning Artist Series” – winning competitions and receiving rave reviews in the States, Europe and around the world. It’s a truly designed line of guitars that stands tall and sounds sweet in the solid top guitar market with hand-selected solid tops and forward shifted scalloped bracing which offer up awesome tone and player experience. 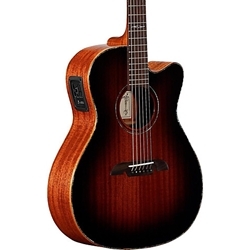 Order this high-performance acoustic-electric Alvarez today!